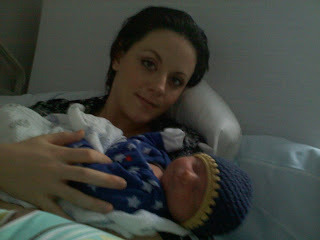 Jett born on January 15 at 1:44 pm. He weighed 8 lbs 10.8 ounces and is 21 inches long. He is healthy and happy as can be. Welcome Baby Jett, aren't you handsome! Us Bijou girls got you a bib that looks like a lot of stuff at the salon, yes you know all our voices! Such a big boy and such a nice large yawn! With cheeks that just scream.."pinch me". For Sarah's clients, Mama, Papa, brother and baby are doing just fine! Everyone is healthy and happy, I'm sure as soon as the weather breaks, you'll see Sarah walking around town with the baby buggy, hopefully making pit stops at Bijou for some oohs and aaahs!